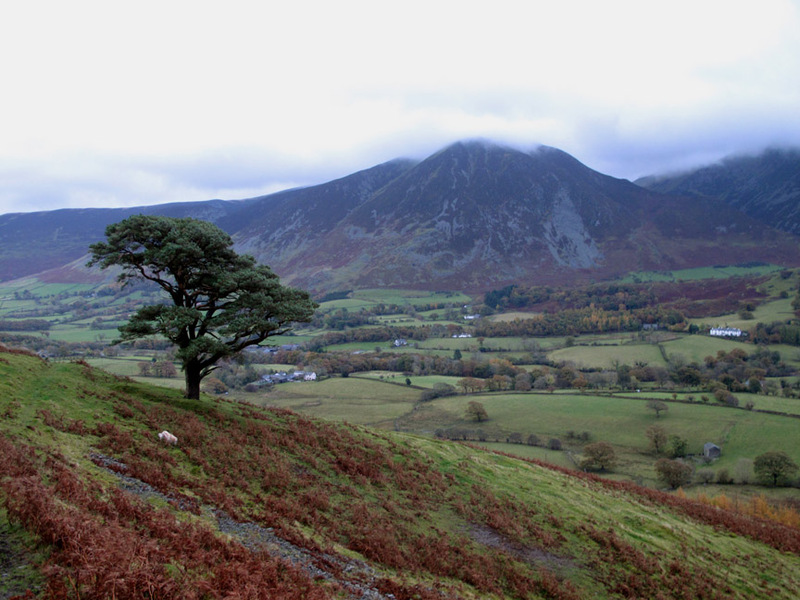 " Low Fell with Sharon and Gary "
Date & start time: 30th October 2012, 3.45 pm start. 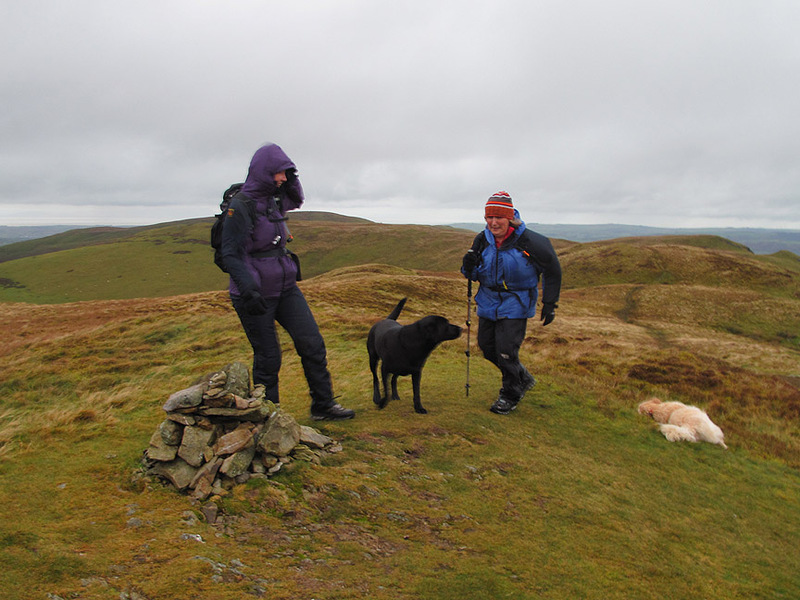 Places visited : Thackthwaite, Watching Crag, Low Fell summit and southern top. 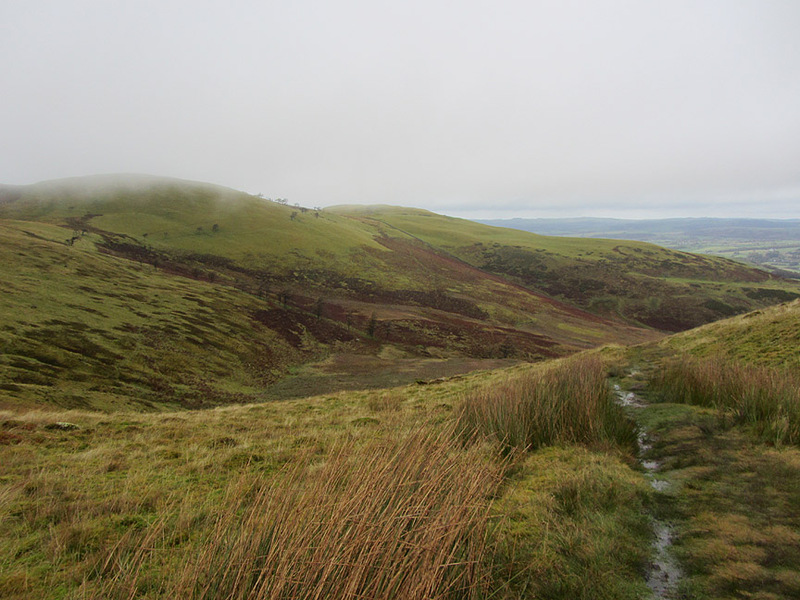 Walk details : 3.5 mls, 1475 ft of ascent, 2 hours 15 mins. 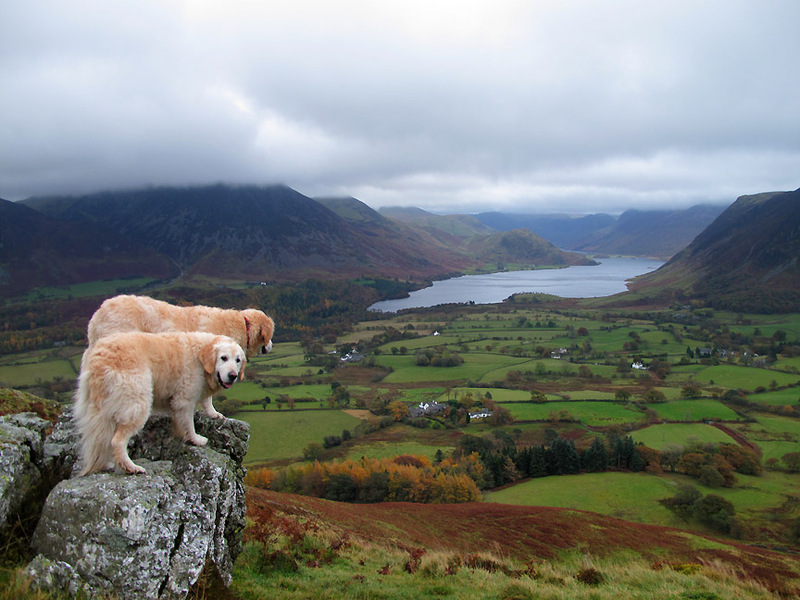 Walked with : Sharon, Gary, Ann and the dogs, Holly, Harry and Bethan. Weather : Bad . . . but getting better ! 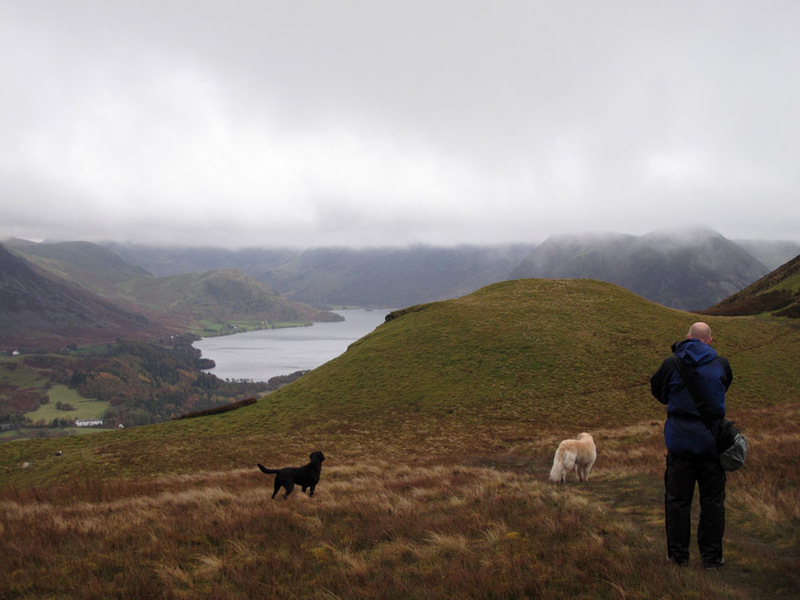 What a difference from our last walk a when few days later a low pressure weather system blew across the whole of the UK. The blue skies and sunshine gave way to low cloud, grey skies and heavy rain. 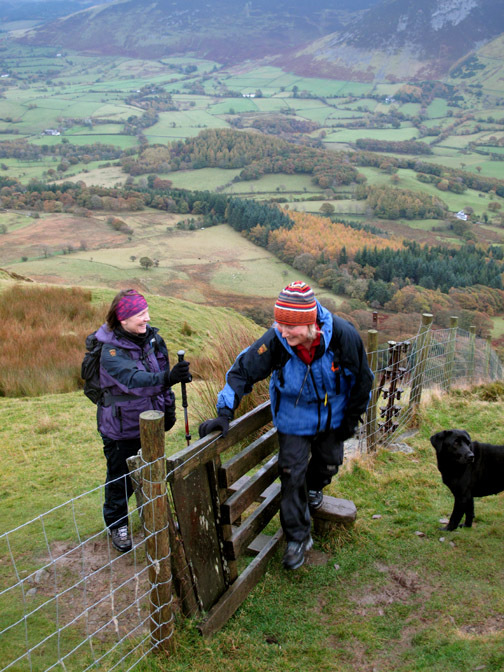 Still the company was good for this local walk up Low Fell ! 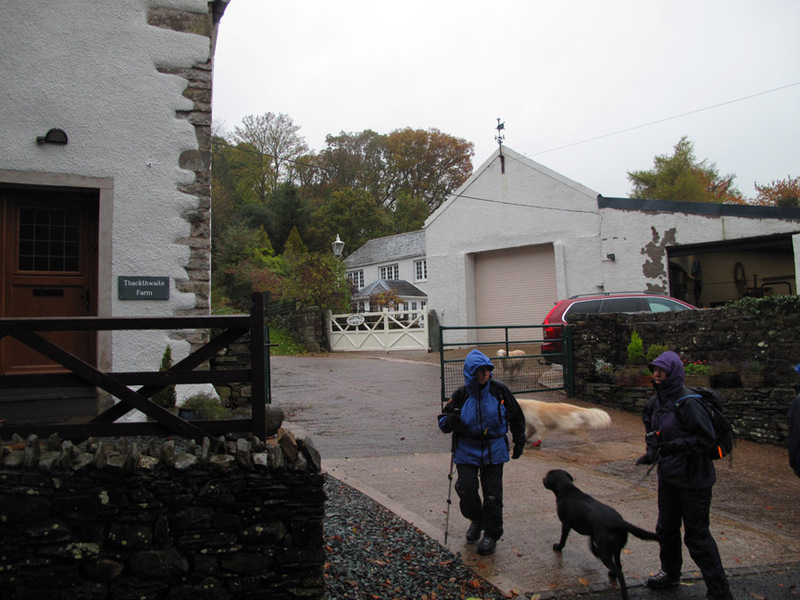 The Paramo / Salomon Team set off from base camp just short of Thackthwaite Village. 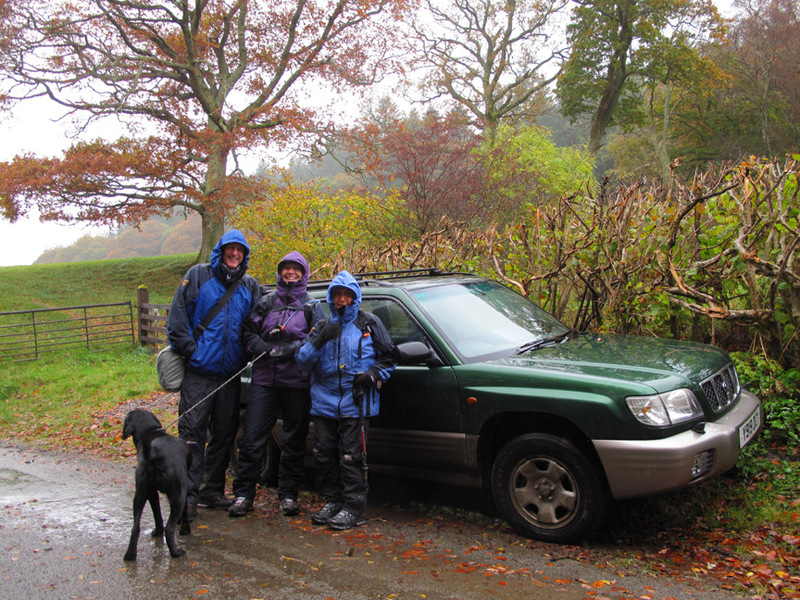 All four of us were wearing paramo Jackets and Salomon fabric boots . . . scary ! A short distance down the road and we entered the small village, turning left up the lane by Thackthwaite Farm. 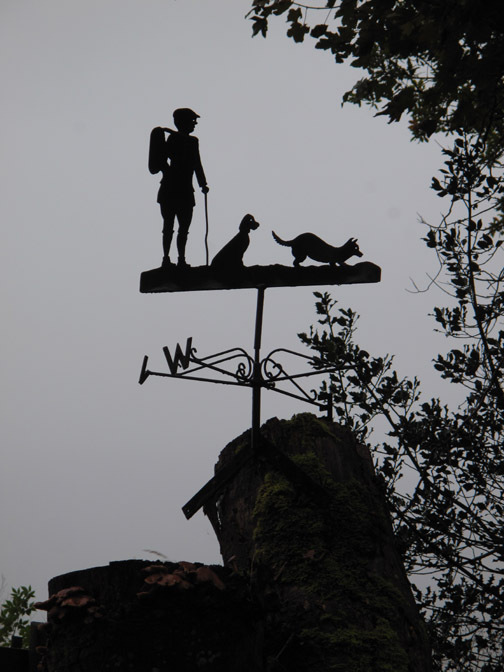 A rather nice weather vane part way up the lane. 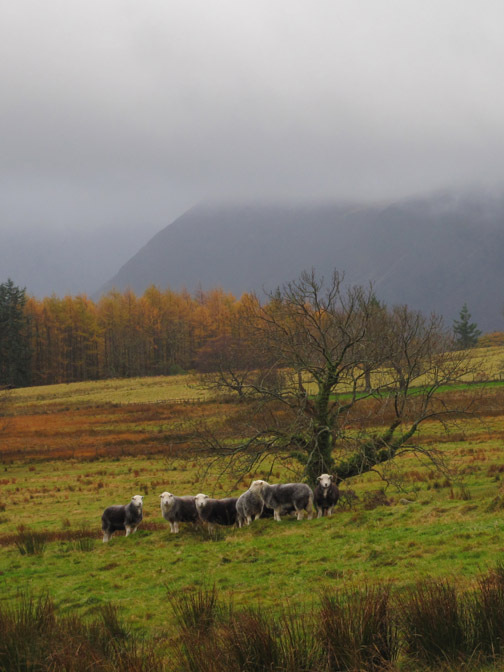 It was a damp day, even the sheep agreed. However all was not lost . . . there were signs of the cloud lifting and the rain was easing off. Sharon and Gary's Holly follows the girls up the field, our Harry was more interested in chasing and chewing sticks. Often slightly damp . . . the second kissing gate was positively soggy after the rain. It has been such a wet summer that any new rainfall cannot soak in at all, it just settles on the surface and forms puddles. 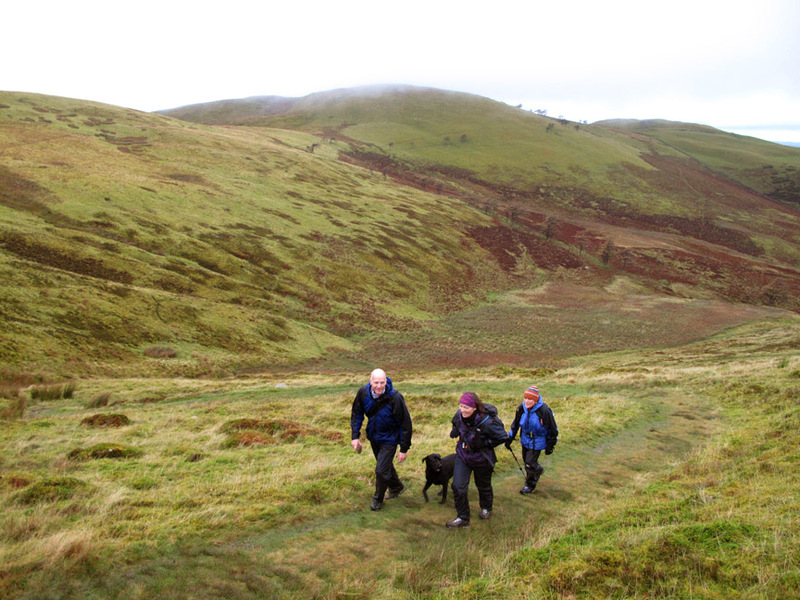 We passed on an ascent of Fellbarrow behind due to the late start. Normally a dry path, even this one was wringing with water. 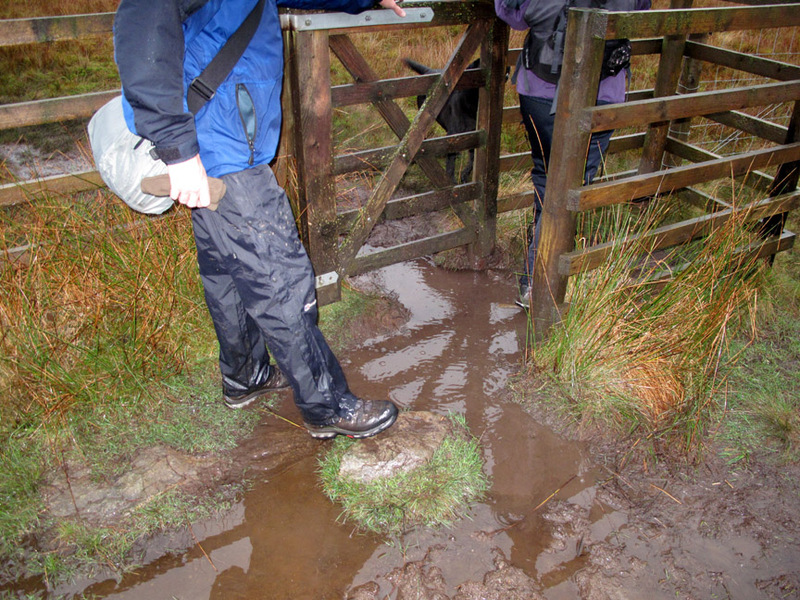 The kissing gate as we hit level ground at the top. 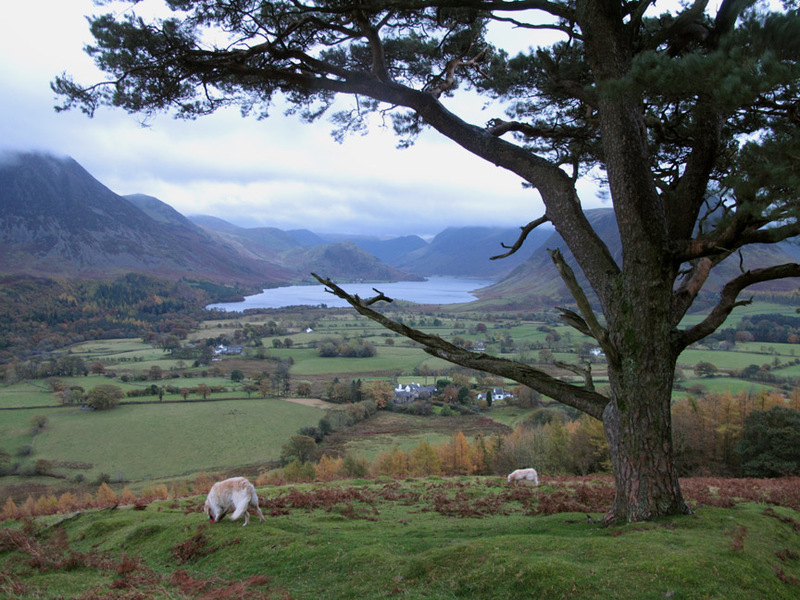 Once through the gate and over the slight brow, we get our first view of Crummock Water from on high. Gary takes the opportunity for a photo. 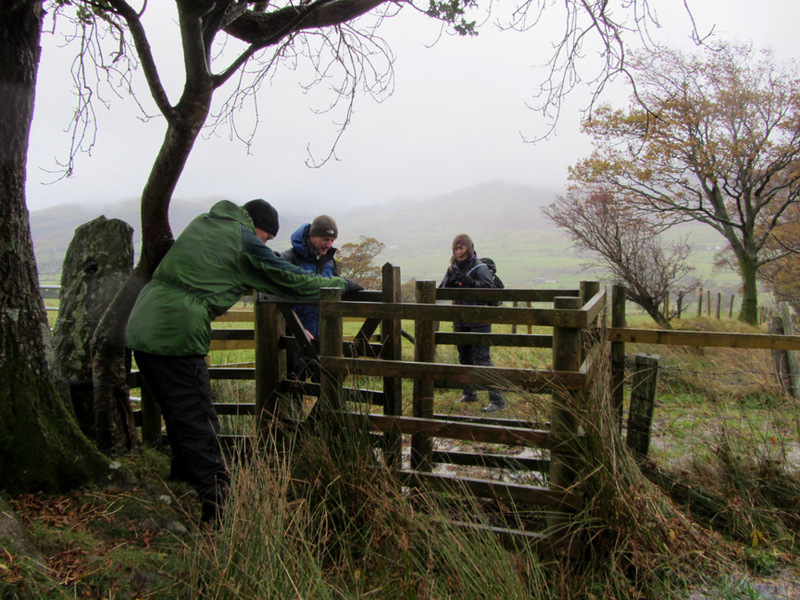 Low Fell is characterised by its many fences . . .
. . . each one needing a gate or stile to cross. Holly suggests it is easier the way she came . . . through the lifting-board of the dog gate. 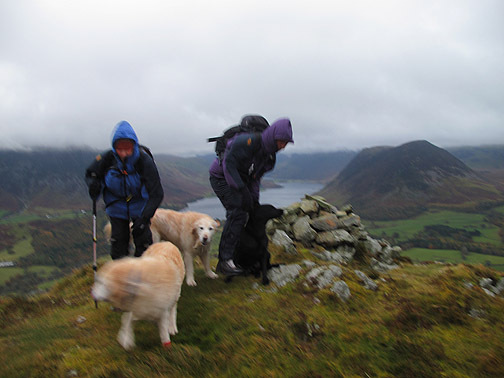 On the exposed summit of Low Fell the wind was significantly stronger. 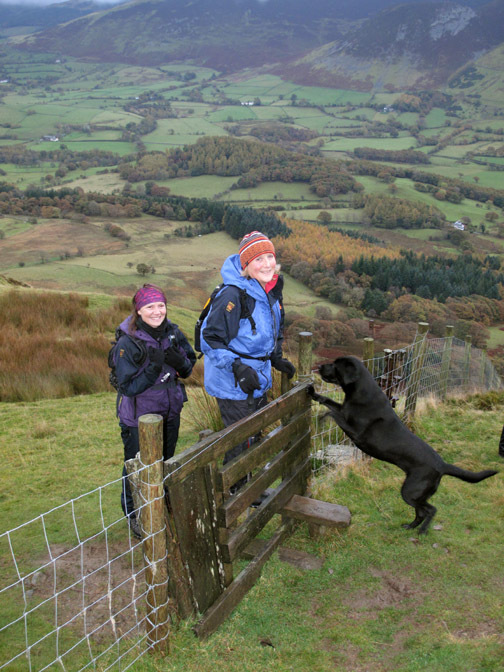 Sharon and Ann are called for a summit photo while Gary and I try and hold the cameras steady ! 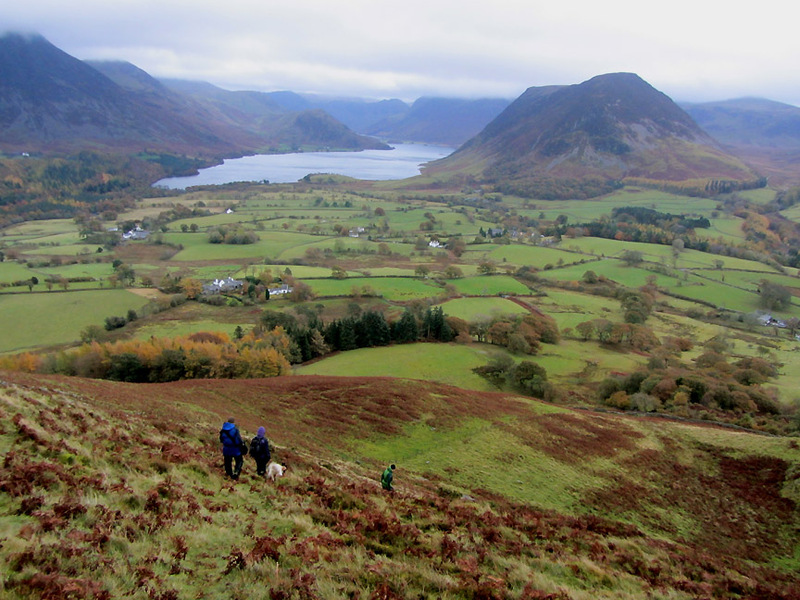 From the highest summit we continued on to the southern top, from where we had our first view of Loweswater. 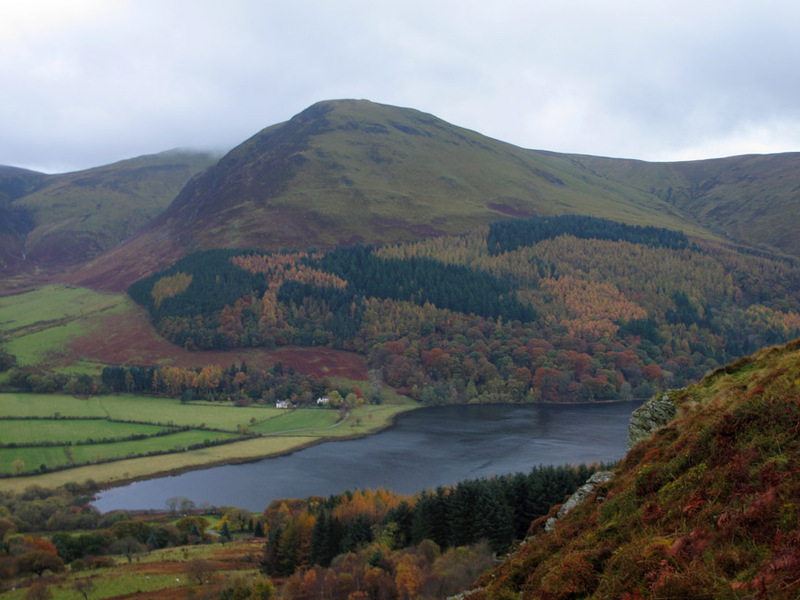 Sharon and Gary had never heard of the "Loweswater Pheasant" so I pointed it out . . . can you spot it in the photo ? Hold your cursor over the picture to give yourself a clue. Was it the wind or the poor light that caused the blur ? Once the dogs were settled there was a split second to grab a photo. that they needed little encouragement to pose on the rock overlooking the lake. It's that pheasant again ! The rain had stopped but the light was starting to fade on this rather grey afternoon. 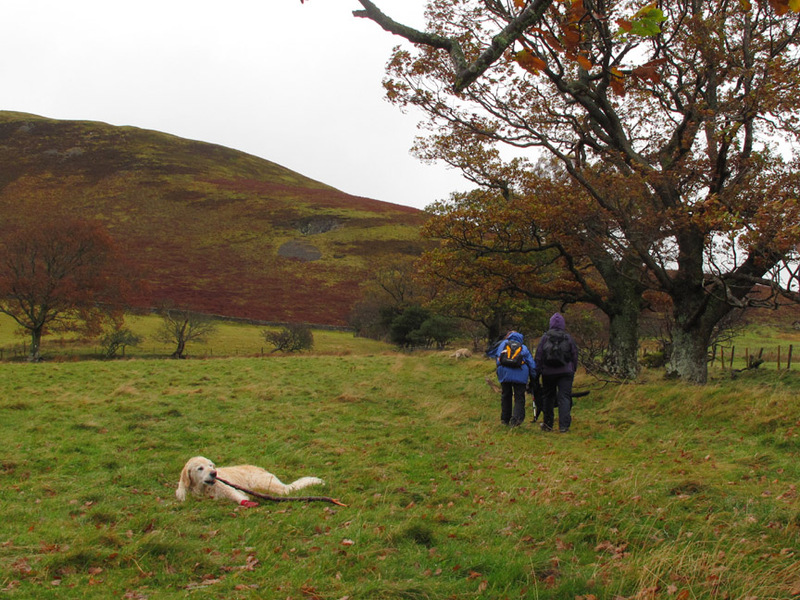 We dropped off the end of Low Fell, heading for the cottage . . . we'd fetch the car later. A diversion took us around to the old pine tree. We were chatting to an elderly local farmer recently and he remembers playing under this tree when he was a lad. He's approaching his nineties so the tree must be double his age at least. 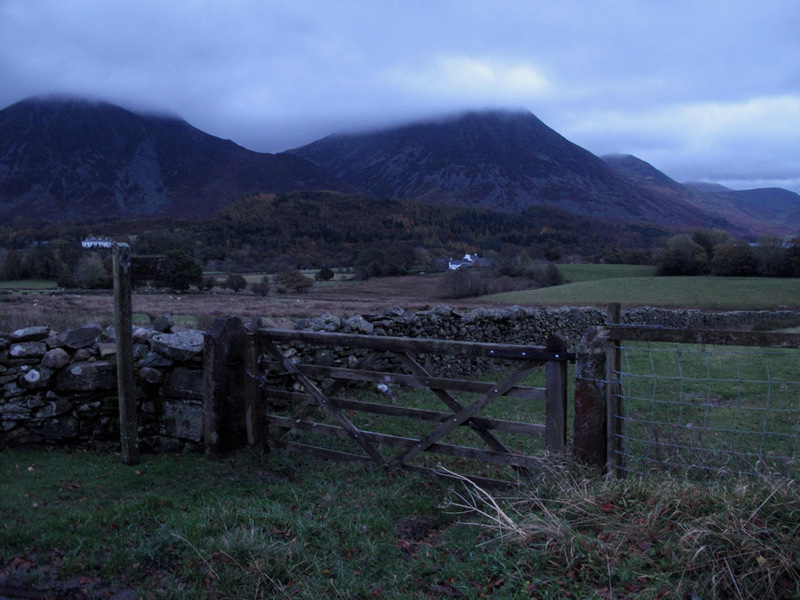 as it was starting to get dark by the time we reached the gate opposite Foulsyke House. 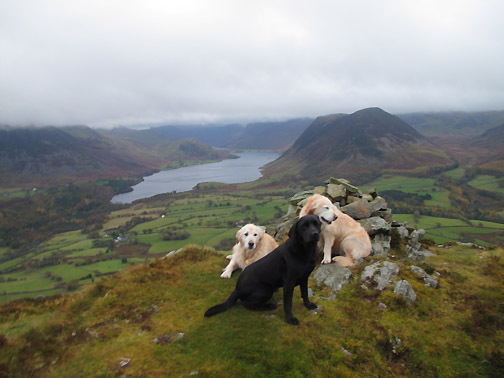 Just two more fields and we'll have the kettle boiling to celebrate another summit towards Sharon's Wainwright total. One of the reasons for Sharon and Gary's visit was to deliver a drawing for a friend of ours. Hilton had requested a picture of his dog . . . and Sharon was able to draw a remarkable likeness for him. It will be easier for him to collect it from here on his next visit than to chance posting it to him. Suzie dog in our garden . . .
. . . Suzie dog by Sharon. If you would like Sharon to create a picture for you of a favourite pet then do give her a call. This site best viewed with . . . an eye for a good picture rather than a good weather forecast !